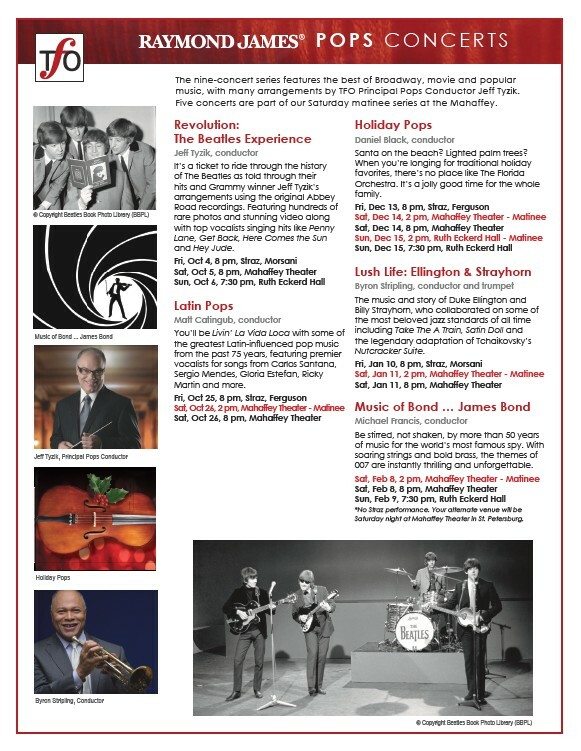 POPS CONCERTS © Copyright Beatles Book Photo Library (BBPL) Music of Bond ... James Bond The nine-concert series features the best of Broadway, movie and popular music, with many arrangements by TFO Principal Pops Conductor Jeff Tyzik. Five concerts are part of our Saturday matinee series at the Mahaffey. © Copyright Beatles Book Photo Library (BBPL) Jeff Tyzik, Principal Pops Conductor Holiday Pops Byron Stripling, Conductor Revolution: The Beatles Experience Jeff Tyzik, conductor It’s a ticket to ride through the history of The Beatles as told through their hits and Grammy winner Jeff Tyzik’s arrangements using the original Abbey Road recordings. Featuring hundreds of rare photos and stunning video along with top vocalists singing hits like Penny Lane, Get Back, Here Comes the Sun and Hey Jude. Fri, Oct 4, 8 pm, Straz, Morsani Sat, Oct 5, 8 pm, Mahaffey Theater Sun, Oct 6, 7:30 pm, Ruth Eckerd Hall Latin Pops Matt Catingub, conductor You’ll be Livin’ La Vida Loca with some of 􀁗􀁋􀁈􀀃􀁊􀁕􀁈􀁄􀁗􀁈􀁖􀁗􀀃􀀯􀁄􀁗􀁌􀁑􀀐􀁌􀁑􀃁􀁘􀁈􀁑􀁆􀁈􀁇􀀃􀁓􀁒􀁓􀀃􀁐􀁘􀁖􀁌􀁆􀀃 from the past 75 years, featuring premier vocalists for songs from Carlos Santana, Sergio Mendes, Gloria Estefan, Ricky Martin and more. Fri, Oct 25, 8 pm, Straz, Ferguson Sat, Oct 26, 2 pm, Mahaffey Theater - Matinee Sat, Oct 26, 8 pm, Mahaffey Theater Holiday Pops Daniel Black, conductor Santa on the beach? Lighted palm trees? When you’re longing for traditional holiday favorites, there’s no place like The Florida Orchestra. It’s a jolly good time for the whole family. Fri, Dec 13, 8 pm, Straz, Ferguson Sat, Dec 14, 2 pm, Mahaffey Theater - Matinee Sat, Dec 14, 8 pm, Mahaffey Theater Sun, Dec 15, 2 pm, Ruth Eckerd Hall - Matinee Sun, Dec 15, 7:30 pm, Ruth Eckerd Hall Lush Life: Ellington & Strayhorn Byron Stripling, conductor and trumpet The music and story of Duke Ellington and Billy Strayhorn, who collaborated on some of the most beloved jazz standards of all time including Take The A Train, Satin Doll and the legendary adaptation of Tchaikovsky’s Nutcracker Suite. Fri, Jan 10, 8 pm, Straz, Morsani Sat, Jan 11, 2 pm, Mahaffey Theater - Matinee Sat, Jan 11, 8 pm, Mahaffey Theater Music of Bond … James Bond Michael Francis, conductor Be stirred, not shaken, by more than 50 years of music for the world’s most famous spy. With soaring strings and bold brass, the themes of 007 are instantly thrilling and unforgettable. Sat, Feb 8, 2 pm, Mahaffey Theater - Matinee Sat, Feb 8, 8 pm, Mahaffey Theater Sun, Feb 9, 7:30 pm, Ruth Eckerd Hall *No Straz performance. Your alternate venue will be Saturday night at Mahaffey Theater in St. Petersburg.